How Do You Solve a Decimal Equation Using Subtraction? Want to see how to solve an equation containing decimals? Then check out this tutorial! 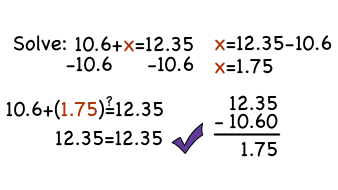 You'll see how to subtract decimals in order to solve an equation for a variable. Then, see how to check your answer so you can be certain it's correct! How Do You Evaluate an Algebraic Expression? Plugging variables into an expression is essential for solving many algebra problems. See how to plug in variable values by watching this tutorial. How Do You Subtract Decimals? Doing math with paper and pencil can come in real handy, so make sure you're comfortable subtracting decimals by hand. After all, you don't want the calculator to be a crutch!